BEIRUT -- Syrian government forces have captured new areas south of the capital Damascus near the Israeli-occupied Golan Heights, increasing pressure on insurgents. The government-controlled Syrian Central Military Media reported that Syrian troops and their allies captured Monday three new areas from al-Qaida-linked Levant Liberation Committee. It added troops are now about 500 metres (yards) from the shrine of Sheikh Abdullah that is sacred to the country's Druze community. The Britain-based Syrian Observatory for Human Right said the fighters are now besieged in the village of Beit Jin and nearby areas after a 10-day intense offensive. 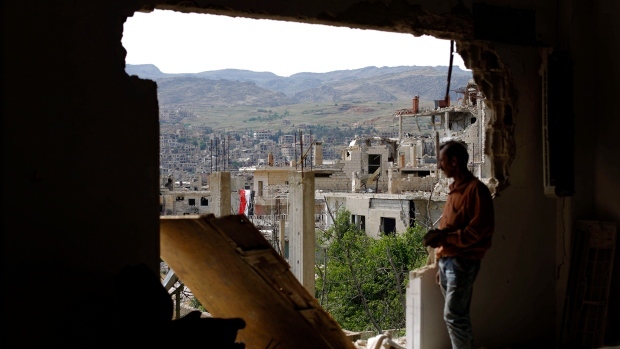 It added that negotiations are underway to evacuate insurgents to the rebel-held northwestern province of Idlib. Israel has been concerned about the push by Syrian troops and their Iran-backed allies close to its border.